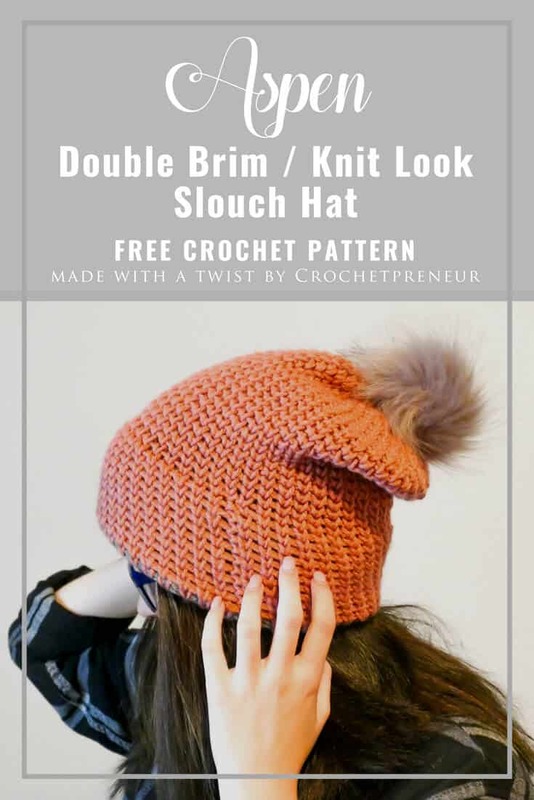 I fell in love with the waistcoat or center single crochet stitch when I was working on designing the Polly Reversible Beanie and I just HAD to make a double brim version! This double brim knit-look beanie is just what I’d been looking for but hadn’t been able to find in just the shape and look I was wanting. This hat is designed to highlight the double brim with contrasting color and to carry just the right amount of slouch. I’m super picky about my slouchies! How about you? Designed to be work in the slouchy pompom version, this hat can also be worn with the brim turned up….Santa style! Versatile, adorable and oh so warm! Are you ready to make yours? Here’s everything you need to know to make your own Aspen Double-Brim Knit-Look Beanie. OR, if you just can’t wait for all of the hats to be released, get the entire pattern e-book, “COZE: All the Double Brims!“ at a special, all-time-low rate. Grab your copy via the e-book image below! To decrease with waistcoat SC: Insert hook into next stitch, draw up a loop. Insert hook into following stitch, draw up a loop. Yarn over and pull through 3 loops. Working a waistcoat SC into a decreased stitch: Insert hook into the first V created by the decrease, draw up a loop. Yarn over and pull through 2 loops. With CC and working loosely, chain 40. Join with a SLST to beginning CH. As you’re working round 2, it will begin looking like this. All of your SC stitches from round 2 forward will be waistcoat SC. RND 21: With the right side of the hat facing you, fold CC portion of the hat up so that it matches the MC portion. Finish off. Use the tail to stitch the hole closed and add pompom. I know you’re going to love making the Aspen Double Brim Knit-Look Beanie and I so look forward to seeing your finished product. Create a project on Ravelry for your unique creation and link it to the Aspen Double Brim Beanie pattern. Follow me on Instagram and share your photos. Be sure to tag @thecrochetpreneur and use the hashtag #aspenbeanie and #madewithatwisters. Such a cute hat! I like how easy the double brim is created.